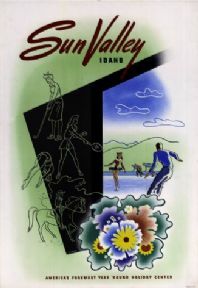 Sun Valley Holiday Center Idaho America. Vintage Poster. Sun Valley Holiday Center, Idaho, America. Vintage Poster. Sun Valley is a resort city in the western United States, in Blaine County in central Idaho, adjacent to the city of Ketchum and within the greater Wood River valley. Tourists enjoy its skiing, hiking, ice skating, trail riding, tennis, and cycling. This poster dates back to the 60s where Sun Valley Holiday Center printed it to attract more people. Independence Hall, Pennsylvania. North American Vintage Tourism Poster. Vintage Indian Court Federal Building Poster. San Francisco, North America. Vintage New york Travel Poster: United Air lines. Vintage Trans World Airlines, Washington, United States Poster. Vintage Travel Poster, Las Vegas, United States.